Join us for our Thursday Happy Hour $8 glass pour Wine Special from 4-9pm! Enjoy custom flights, glass pours, half carafes, growler fills, and open bottles purchases! 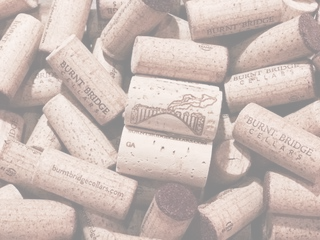 Make Burnt Bridge Cellars your regular spot on Thursday evenings for fine wine and good friends. Cheers! Check out the new art show too! All pieces are on sale through the end of May. “Seeing art and beauty in every day common things enriches your life. I come from a fine art background and have always used photography, like any other art medium, to find or make interesting shapes, colors or light. Photographs are where I find them. It can be a walk down the street, in the park or around the house. Potential photos are all around us. Sometimes it’s an object, or interesting shapes, or light and how they work upon each other. We just have to find them, and the fun is in the hunt! The making of a print is the final process in creating a finished work. The physical print is the end product of the original version. If it lives only on a screen it’s only a facsimile of a photo. The photographs in this collection include a variety of subject matter and styles, created over a long period of time. They include both Black and White, and Color. Ted was born in Chicago and grew up in Long Island, New York, Arcadia, California and the Puget Sound. He studied Fine Art at Western Washington State in Bellingham and graduated from Evergreen State College in Olympia in 1973. Ted moved to the Portland Metro area in 1975, and he feels most at home in the Pacific Northwest. Ted enjoys art, music, literature, fine wine, good food, dogs, and traveling. Some of his favorite places he’s traveled to are the Southwestern states, and the City of Santa Fe, New Mexico. Ted’s hobbies include photography, playing ethnic flutes and guitar. "As an artist and healer, I honor the awareness I have cultivated to create and move energy through my hands. Through the creative and healing arts, I have found a deep sense of purpose and connection. It is with great joy that I share these gifts with you." To learn more about Vicki's art, please visit her website: www.vickimcardle.com.